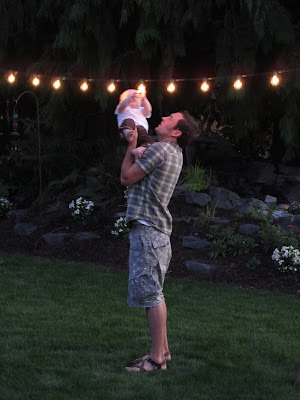 Charlie and I arrived in Washington a few days before the Puyallup Fair began (read: best. fair. ever.). I may be a bit biased (as it is located in my home town) but it is one great state fair with a great theme song. Scones, fudge, taffy, giant pumpkins, giant slides, little piglets, massive horses, this fair has it all. Little know fact: my mom won the blue ribbon one year for whole wheat bread. True story. And the judges didn't even taste it fresh out the of the oven and smothered with honey, like I did throughout my childhood. The newest member of the Temus clan got into the fair spirit too. The Charlies discussing fair food like scones. Stuff of legends. The only night our schedules combined to get us all to the fair at the same time was the first night it was open. This meant that the giant pumpkins had not yet been weighed and displayed. 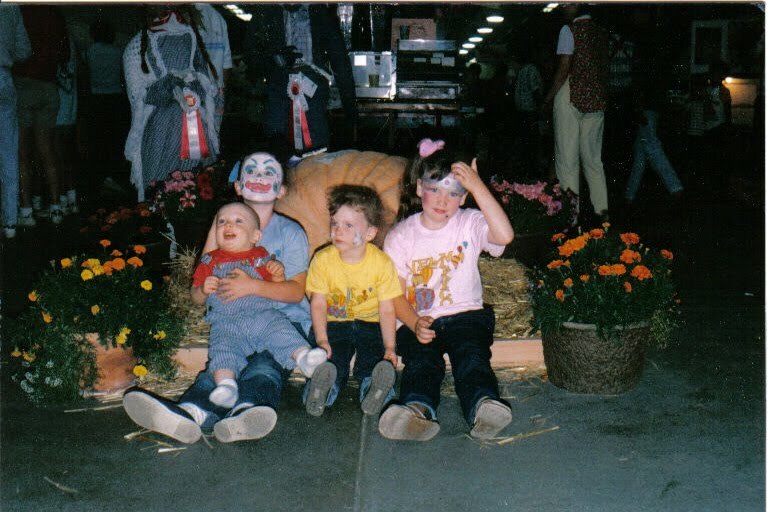 It has been a Temus tradition, ever since before Sarah had discovered her toes, to take a picture of the kiddos in front of the largest pumpkin at the fair (see examples below). Sadly the grand kids' first giant pumpkin picture was not, in fact, in front of the largest pumpkin, but rather a runner up. Maybe that is why they look so disgruntled about the situation. 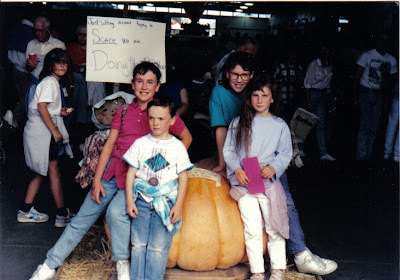 Other note-worthy Puyallup events at the time included the salmon run. Dad did his best to catch what he could and I gratefully brought some of the smoked spoils of his efforts back to NC. One morning I accompanied him to the Puyallup River before Charlie woke up (thanks for watching him Sarah!). As it turns out, I did the fishing and he did the catching that day, but I still greatly enjoyed the morning on the river with my dad. I hope I never get too old to go fishing with him. Blackberries were also going crazy all over the place. Sarah and I went on a long rambling walk with the babes that included picking an enormous amount of the juicy delights (some of which made it back to the house). There was more berry eating then walking going on and it was wonderful! Charlie helping Joe hang lights. We did have a bit of work to get done while we were there as well. There was reception #2 to prepare for in the backyard. Mom and Dad did a great job with the planning and prep. It was lovely. The day after the reception we slept in (minus the babies and their mothers that is) and relaxed the day away with family. Perfect. 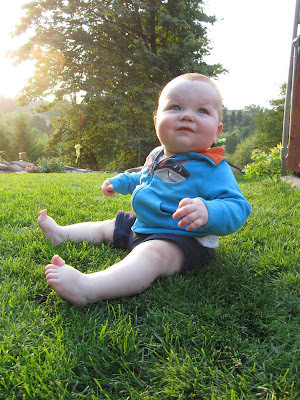 Charlie loved being allowed to sit in chigger-free grass (unlike his summer in Missouri). Plato (who has limited experience with babies) came right up to him, plopped his stick down, and fully expected him to throw it for him. Charlie wasn't sure what to do with it and Plato didn't understand what was taking him so long. Charlie's favorite part about the backyard was relaxing in the swing. He could have stayed there all day completely content. Thanks Liz and Cory for getting married so we could come visit! It truly was two of the best weeks of the year. I seriously can't get over how cute Charlie is! Weddings and families truly are an amazing combo. Paul loves the Charlie, Plato, and "the stick" pics. I love the Liz, Cory, and "the corn" pic. We both love Katie!